Shortly after, I discovered another awesomely inspiring blog, Free to Dream, where the author ended up on an amazing journey through life, and it all began with a list. Interestingly, she had a giant list that she started building as a child, but when she turned 30 she made a decision to cross 30 things off her list in that year, which she called Project 30/30 (read her super cool story about it, here). And this is when the list-maker inside of me couldn’t take it anymore. At this point, I knew I needed to make a list of my own. The point of this little project is not to compete with myself and make sure I cross off every item in order to avoid a self-instigated guild trip, later. It’s to motivate me to make the most of myself and of my time. Relaxing is a great thing, and we all should do it. But how often does relaxing turn into just being lazy? Too often, in my case. Time to step up my game. I will update you as I cross things off the list, and you can check in on my progress anytime by going to the new tab on my home page called My List. Some of these things will make for interesting posts, I’m sure. Haha, I know the feeling. I make lists all the time. It just makes me feel more organized and motivated. 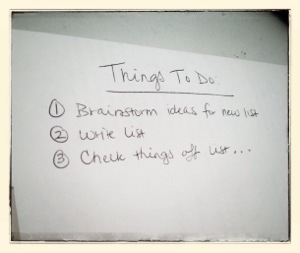 I definitely need all the help I can get these days, I’ve gotten so swamped with other projects. I’ve made a commitment to myself to do 5 silly, frivolous things from my list this year like learning the ukelele or taking king fu classes 😉 Haven’t decided on the final 5 yet but I’ll check back in soon. What are you working on at the moment? Hmmm, running. I never “got” running, it just feels like hard work. But you chase after that goal (literally) and I’ll cheer you on from the cyber sidelines. Good luck! Fantastic list! Good luck!! Have you started already? Wrote a blog post yesterday on discovering things in your expat country – first thing on the list was Start right away!! In a way, I’ve started already, yes. I’m starting to run and practice breathing, I’m looking around at options for classes, I’ve got some tickets to some sporting events in my pocket, and it’s almost bicycle weather! Let’s see how this goes, haha. And I definitely agree that the first thing to do in a new country is explore whatever you can, as soon as you can. Looking forward to reading your blog! The list-maker in me is very excited about your project!